Be the first to share your favorite memory, photo or story of Lidia. This memorial page is dedicated for family, friends and future generations to celebrate the life of their loved one. 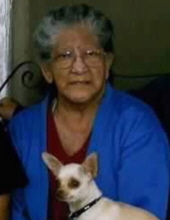 Lidia Becerra Cairns, 80 of Hume, Missouri, formerly of Kansas City, Kansas passed away June 12, 2018 at her son’s home in Hume. Funeral services will be held 2:00 pm Saturday, June 16, 2018 at Mullinax Funeral Home, Butler (660-679-0009). A visitation will be held prior to services Saturday, from 1:00 pm to 2:00 pm, also at the chapel. Cremation will follow services. Memorial contributions may be made to Heartland Hospice. Messages of condolence may be left for the family at www.mullinaxfuneralhome.com. Lidia Becerra Cairns was born December 19, 1937 in Kansas City, Kansas to John and Lucy Overa Becerra. She grew up and attended school in the Kansas City area. Lidia was united in marriage to Donald Cairns. Throughout her life Lidia would work in various jobs, from drug stores, factories, and catering, always working hard no matter the job. When she wasn’t at work, she was a loving and devoted mother to six children. Lidia was preceded in death by her parents, husband Donald Cairns, son George Cairns, and siblings, Richard Becerra, Joe Becerra, Johnny Becerra, Charlotte Montear, and Lucy Miller. She is survived by her son Frank Becerra and wife Tina of Hume, MO., son Tim Cairns and wife Barbara of Independence, MO., son Dennis Cairns of Kansas City, MO., daughters Donna Cairns of Hume, MO., and Morning Star Lang of Toganoxie, KS., along with 15 grandchildren, 24 great-grandchildren, sisters, Rosie Tizon and Patricia Rodriquez of Kanas City, MO., and many nieces, nephews, and extended family members. To send flowers or a remembrance gift to the family of Lidia Becerra Cairns, please visit our Tribute Store. "Email Address" would like to share the life celebration of Lidia Becerra Cairns. Click on the "link" to go to share a favorite memory or leave a condolence message for the family.